No seed sowing, no thinning, no fuss; just push them into the earth where you want them and watch them grow! - Unpack sets on arrival and spread in a light cool position until planting time. Plant September-mid November, leaving tips of bulbs above the soil surface, allowing about 10cm (4") between sets and about 30cm (12") between rows. 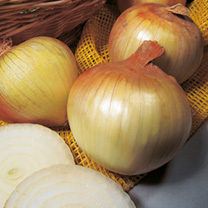 250g of onion sets (approximately 60 sets) will plant a row of about 6m (19'). Size of sets 14/21mm. Onions are one of our most invaluable vegetables and also one of civilisation's oldest medicines. They can help lower blood pressure and cholesterol levels, and are anti-asthmatic, antibacterial and antiseptic.